The Alternative for Germany (AfD) political party has made history and won 12.6% of the vote in this year’s German election. While Angela Merkel’s Christian Democratic Union won her a fourth term as Chancellor with 33% of the vote, this is the first time in recent history that an openly right-wing party has won major seats in the Bundestag. AfD’s 90 seats mark a significant trend in European politics; more and more people are turning away from the left-leaning “legacy parties” in a rejection of the European Union’s globalist outlook. Since the stunning Brexit referendum victory in 2016, European voters have made clear that the policies of uncontrolled mass immigration, supranational courts, and globalism are not wanted. The Brexit vote won 52%, Marine Le Pen’s National front won 34% of the second round Ballotage, and Geert Wilders’ PVV gained 20 seats (out of 150) making it the second largest party in Holland. These are all described as “right-wing” movements, and they are gaining ground fast. As the EU continues to blunder into financial dire straits, uncontrolled immigration from Africa and the Middle East, and seeks to push “ever closer union,” voters are starting to look away from the Status Quo. What is extremely poignant is that AfD won a majority of their new seats in East German constituencies. This follows a pattern of anti-EU sentiment in former Communist areas. These people have lived under the iron fist of Communism, and do not want to go there again. The EU is a Communist structure at heart, with present and former Presidents being Maoists, Communists, and Socialists. AfD is the first openly right-wing party in more than 60 years to take seats in the German Bundestag, and has made huge strides in breaking up the coalition cartel that has defined German politics for the last decade. And although they are now the third largest party, they will not be sharing in power under a “grand coalition.” Chancellor Merkel has made it very clear that there “will be no place” for the AfD in deciding policy or running the government. Again, the shutting out of power is a common theme in European politics. Beginning with the election campaign period, legacy parties group together to block votes from insurgent parties; in some cases, standing aside to ensure that the vote against these “populist” groups is not split. And when it comes to creating the actual government, deals are made with any other group. AfD began as an anti-EU party in reaction to Germany being forced to bailout the Greek government. The German state is the largest net contributor to the EU budget, and the lion’s share of the bailout money came at the expense of German taxpayers. It was founded by a group of business savvy economists, and unlike many other populist movements in Europe, its membership is made up of a significant number of “high earners,” around 39% of members are in the higher income bracket. The party did not even exist five years ago, and to make such strides in this short amount of time is a major worry for Merkel, the EU, and any European parties that promote an open-door migration policy. AfD’s real success began building with their opposition to “Merkel’s Madness”: the open invitation to all who are fleeing poverty to be classified as refugees. This decision lead to around 1.3 million undocumented migrants and refugees coming in; including Jihadist terrorists who destroy their papers before entry. "Moderate" Muslims who accept integration are "valued members of society," and they argue that multiculturalism does not work (this assertion has now been accepted by several mainstream parties). At the heart of the European Union project is “ever closer” union. Commission Leader Jean-Claude Juncker has stated that he seeks to build an EU military complete with navy and air force, and French President Emmanuel Macron has set forth his vision for a more integrated Europe with a single EU budget with Ministers in control of it. AfD’s victory puts this vision at risk. 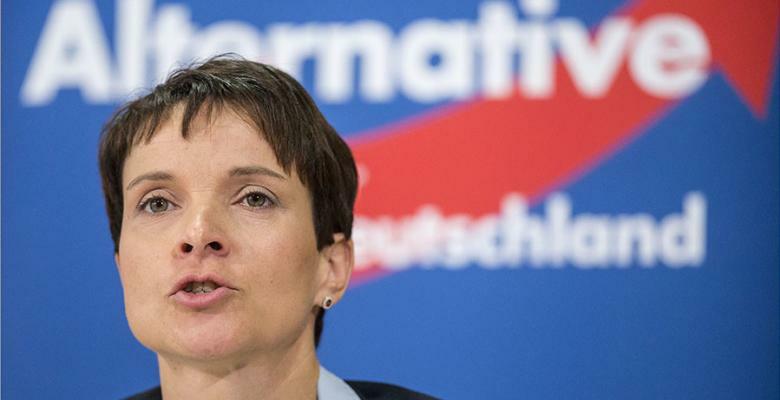 Just after celebrating their victory, one of AfD’s leaders, Frauke Petry, announced that she was leaving the party and will, instead, stand as an independent member of parliament to represent her Saxony constituency. The resignation shocked not just the media, but also those in her own party. Petry has been a strong voice in the party pushing for a more mainstream approach in the hopes that they could (as a party) join part of a coalition and as such have a larger share of power; however, the party has been resistant to these calls and insisted on being an “anti-Merkel” movement.